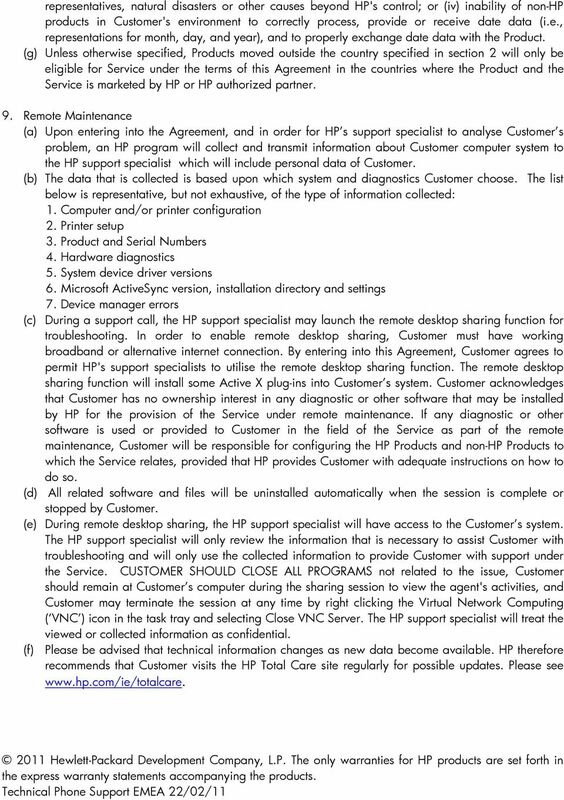 Download "HP Technical Phone Support service agreement ( Agreement ) terms and conditions"
4 10. Assignment: Customer shall not be entitled to assign any of his/her rights under this Agreement including the right to receive the Service. 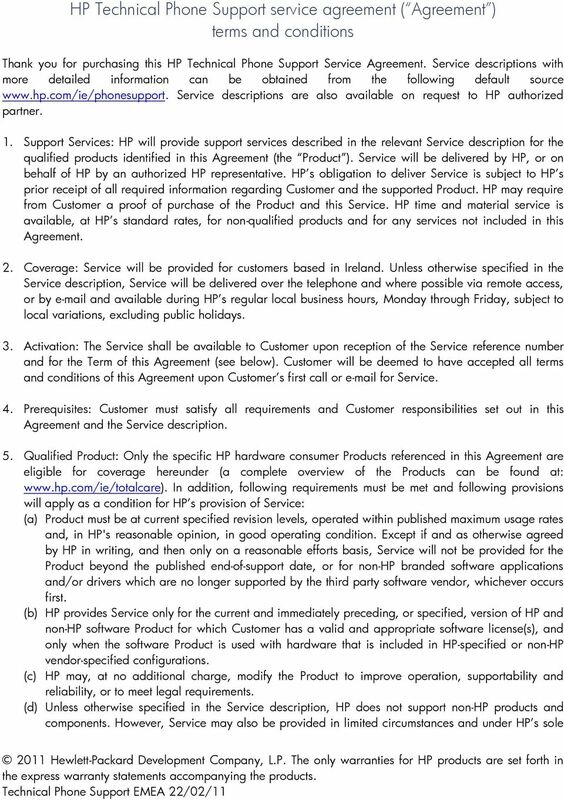 HP may subcontract any or all of its obligations under this Agreement provided that it shall remain liable to Customer for performance of the Service in accordance with said Agreement. 11. Term: This Agreement begins on the date of purchase of the supported Product (i.e. upon confirmation of Customer s order and reception by Customer of the Service reference number) unless otherwise stated in the Service description, and continues until the number of incidents have been reached or end of the Service period specified in the Service description, as applicable. 12. Termination: HP may terminate this Agreement at any time by written notice if Customer fails to perform any of its material obligations under this Agreement or to observe any of its terms and conditions. 13. Performance warranty: Where provided under applicable law, HP s responsibility and obligations in respect of any statutory warranty for the performance of Service in conformity with this Agreement is limited to a period of up to twelve (12) months following the expiry of the term of this Agreement. 14. Limitations of Liability and Remedies: HP will not be liable for performance delays or for nonperformance due to causes beyond its reasonable control. 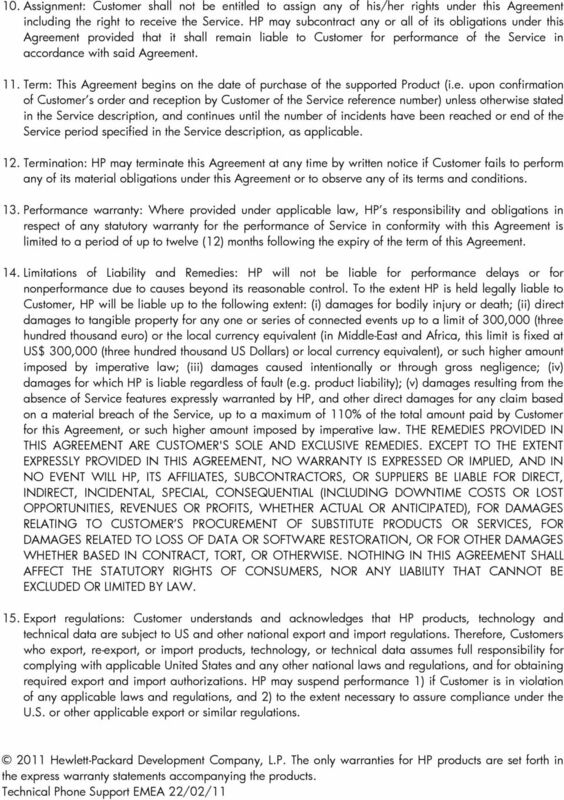 To the extent HP is held legally liable to Customer, HP will be liable up to the following extent: (i) damages for bodily injury or death; (ii) direct damages to tangible property for any one or series of connected events up to a limit of 300,000 (three hundred thousand euro) or the local currency equivalent (in Middle-East and Africa, this limit is fixed at US$ 300,000 (three hundred thousand US Dollars) or local currency equivalent), or such higher amount imposed by imperative law; (iii) damages caused intentionally or through gross negligence; (iv) damages for which HP is liable regardless of fault (e.g. product liability); (v) damages resulting from the absence of Service features expressly warranted by HP, and other direct damages for any claim based on a material breach of the Service, up to a maximum of 110% of the total amount paid by Customer for this Agreement, or such higher amount imposed by imperative law. THE REMEDIES PROVIDED IN THIS AGREEMENT ARE CUSTOMER'S SOLE AND EXCLUSIVE REMEDIES. 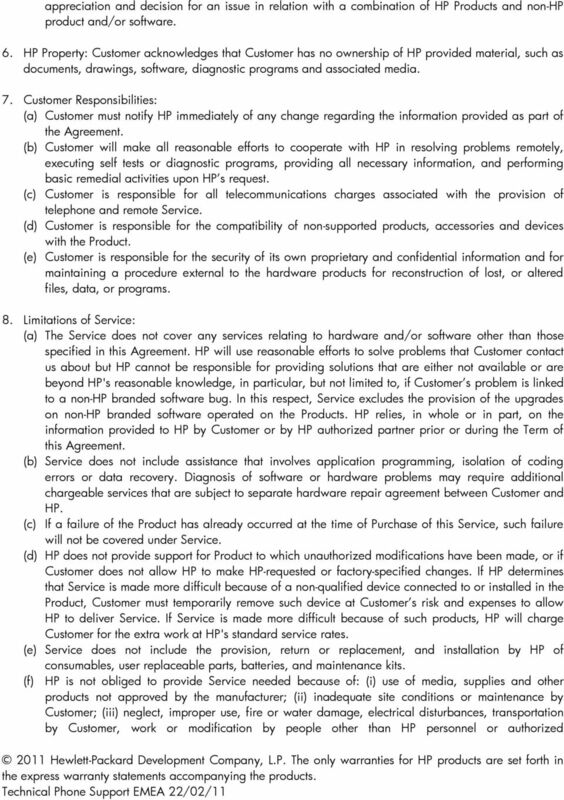 EXCEPT TO THE EXTENT EXPRESSLY PROVIDED IN THIS AGREEMENT, NO WARRANTY IS EXPRESSED OR IMPLIED, AND IN NO EVENT WILL HP, ITS AFFILIATES, SUBCONTRACTORS, OR SUPPLIERS BE LIABLE FOR DIRECT, INDIRECT, INCIDENTAL, SPECIAL, CONSEQUENTIAL (INCLUDING DOWNTIME COSTS OR LOST OPPORTUNITIES, REVENUES OR PROFITS, WHETHER ACTUAL OR ANTICIPATED), FOR DAMAGES RELATING TO CUSTOMER S PROCUREMENT OF SUBSTITUTE PRODUCTS OR SERVICES, FOR DAMAGES RELATED TO LOSS OF DATA OR SOFTWARE RESTORATION, OR FOR OTHER DAMAGES WHETHER BASED IN CONTRACT, TORT, OR OTHERWISE. NOTHING IN THIS AGREEMENT SHALL AFFECT THE STATUTORY RIGHTS OF CONSUMERS, NOR ANY LIABILITY THAT CANNOT BE EXCLUDED OR LIMITED BY LAW. 15. Export regulations: Customer understands and acknowledges that HP products, technology and technical data are subject to US and other national export and import regulations. Therefore, Customers who export, re-export, or import products, technology, or technical data assumes full responsibility for complying with applicable United States and any other national laws and regulations, and for obtaining required export and import authorizations. HP may suspend performance 1) if Customer is in violation of any applicable laws and regulations, and 2) to the extent necessary to assure compliance under the U.S. or other applicable export or similar regulations. 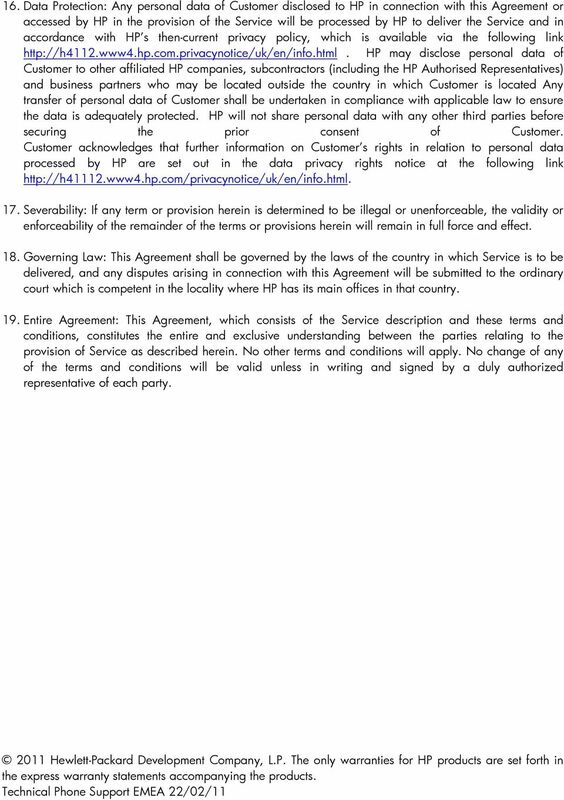 Support Service Agreement Terms and Conditions (Florida version) 1. Support Services: Technology Insurance Company ( TIC ) is the Service Contract Provider for HP Consumer Products in the State of Florida. MyShortcut Administrator's Guide January 2011 www.lexmark.com Lexmark and Lexmark with diamond design are trademarks of Lexmark International, Inc., registered in the United States and/or other countries.